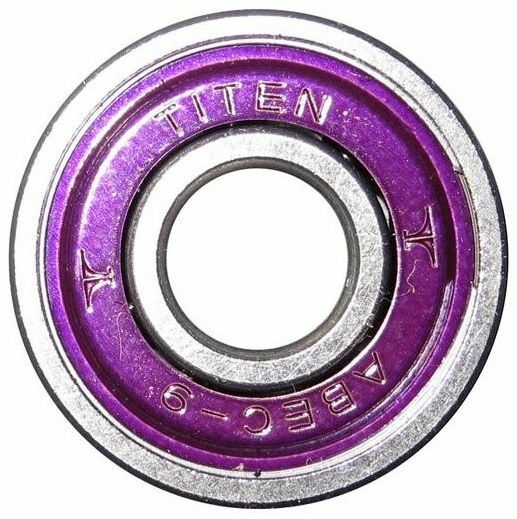 Titen bearings are made of superhard carbon steel and withstand designed on the biggest gaps and maintain their performance after months of riding. They come in different degrees of accuracy of ABEC 5 to 9. All bearings are sealed with metal covers that offer wet and dusty effective protection under the conditions. Amended Titen to lubricate the lubrication of oil, extending considerably the life of the bearings. Titen bearings with viscoseal fat, specifically designed for outdoor use. The fat is dispersed by the rotation of the bearing to the outside and seals any cracks and openings. This effectively prevents penetration of dust and dirt and leads to a much longer life expectancy and speed. Although initially more slowly than oil we recommend it to most drivers due to its maintenance free nature.